It is without doubt that we show our real self/character when we get very angry, do you agree with me on that? I guess you do. Emotions which is a strong feeling of either joy or anger, the anger part of it is where my i will focus on in this write-up. Anger is a state of mind caused by strong displeasure. I will say that it is absolutely natural and normal to get angry cause that is just the way we were created. But my worry is sometimes some people do some crazy and unimaginable things when they get angry which they regret later on when they are sober and most time we found out that the particular reason why we lost our cool and probably made some utterances or did some unimaginable things all in the name of anger was not just worth it, trust me. I know that some people can really really be annoying but even at that taking action almost immediately can never make things better cause no decision taken in anger can ever be helpful. 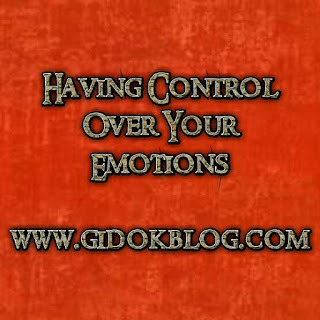 Finding it difficult controlling your anger? After reading the control measures below you will find it easier from today. Take a deep breath: Our breath tend to rush when we are angry which is not a good thing. Just take a moment and take a deep breath cause speedy breath can only increase your anger. Do not talk: keeping quiet is key in this situation cause talking in the heat of the moment can only worsen the situation, I know it is quite difficult to hold back without expressing yourself verbally but that will not solve the problem so keep still. Take a glass of cold water: It sounds funny but it is very effective because it can help cool and stabilize your body temperature thereby restoring a degree of calmness in your body and mind. Take a walk: Taking a long walk can help reduce the stress and tension, restore calm and also make avoid saying or doing things that you will regret later. Dialogue: One funny thing about anger is that it varnishes under little time especially when the damage has already been done. After taking that long walk, sit down with the person you had misunderstanding or problem with and have a talk with the person, stating what and what the person did that you do not like and he/she will in turn speak his/her mind about your differences and trust me this time around you both will be in the right state of mind to settle your differences amicably. So you see anger is no big deal but we make it one. 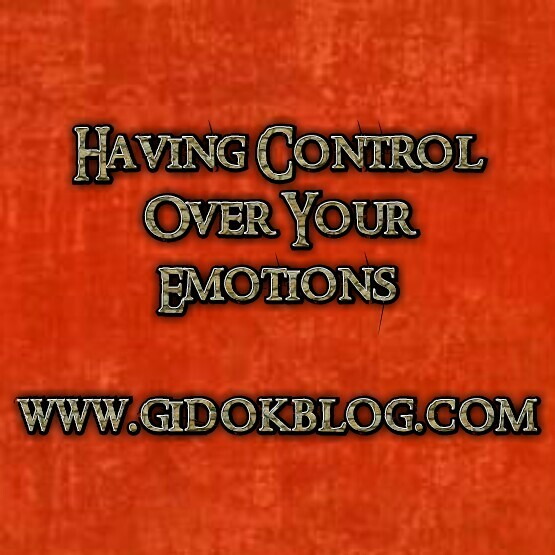 If you can apply those control measures whenever you get angry, there will not be any cause for alarm. Quote of reference: "Situations are either good or bad but thinking makes it so"
This was a great article. Learning to control our emotions is critical to our own self-growth! Yes it is jay. Thanks for stopping by..
great post it is very important to control your emotions, I know that all to well. Am happy you know Catherine. Yes they are Stephenie, thanks for stopping by. This is such a great idea. I never though taking a glass of cold water might help. I should try it next time. Yes it does help to an extent Anna. This is a great article and very important topic. Always like your posts Gideon. Amazing post. Self control is something which you can grow day by day. That is true Dailydosesofbeauty, we grow each day. 100% this - love it, believe in it - and I agree wholeheartedly. Am so happy you could relate to it and thanks for the feedback. Great ideas. Being silent and walk away is the best way to control the emotions. Nice read. Silent can be very effective at times like this. I also find meditation and visualization are great tools for helping to overcome blocks and obstacles and manage emotions/stress. You have a point there Tracy, thanks for contributing. This post is useful! I'm easy to lose my temper especially in a discussion and even get angrier when talking to people at that moment. Maybe I have to calm myself down first and be quiet for a while. You really need to work on that Hannah. Words to live by. I have PTSD, and emotional dysregulation is a symptom so I really struggle with this. Rage rage rage all day. Hmmmm!! That's a tough one my dear but you just need to try your very best and also pray for God's intervention. It can only get better Elizabeth. This is really an interesting post! I didn't know that about water - I will keep this in mind! I am actually really good at controlling my emotions for the most part - unless I am super super hungry, LOL! Great tips to help manage such a strong emotion! This will be very helpful more many people. Thank you for sharing! This is a great article! I have found that breathing and not saying anything at all are the best things for me to do as I can be really headstrong and impatient about certain things and get really triggered when people disagree with something I am passionate about (total Aries, here). I heard the "situations are either good or bad but thinking makes it so" quote a long time ago, but man is that ever true! I'll have to keep that in my phone so I can reflect on it when I'm on the track of over-thinking a situation. I agree with this... It takes a lot of control and patience to get to that point of being able to slow down and take over yuour own emotions rather than the other way around. These cool-down tips are good starters for that. That's a lifelong struggle for some, now isn't it? LOL. Not as easy as it sounds. Thank you for sharing the wonderful tips, Control over the emotions is most important thing to go forward in the life. Taking a walk always helps me. Even better if it's a nice, long one. All of those help you get composure over things. Although I'm not sure being told not to think about something helps in the moment. It actually makes me focus on the thing which upsets me more.